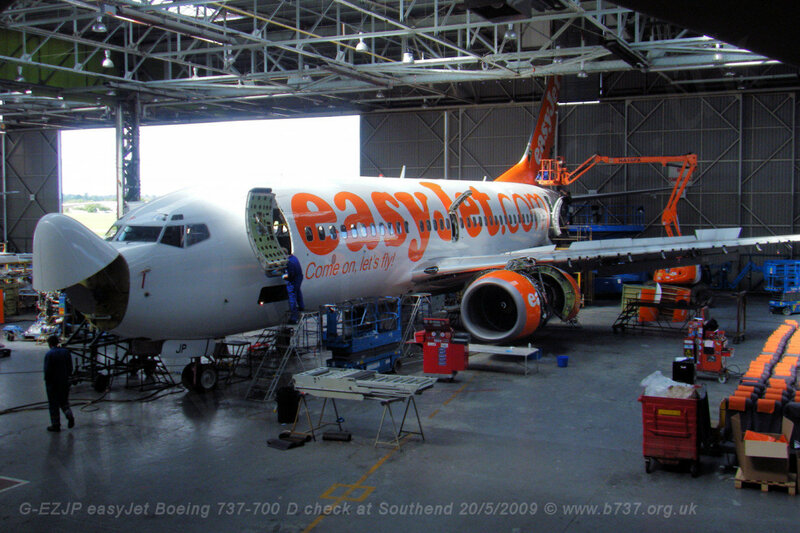 The 737 like all airliners undergoes periodic heavy maintenance this page describes soem of the maintenance programs and checks involved. 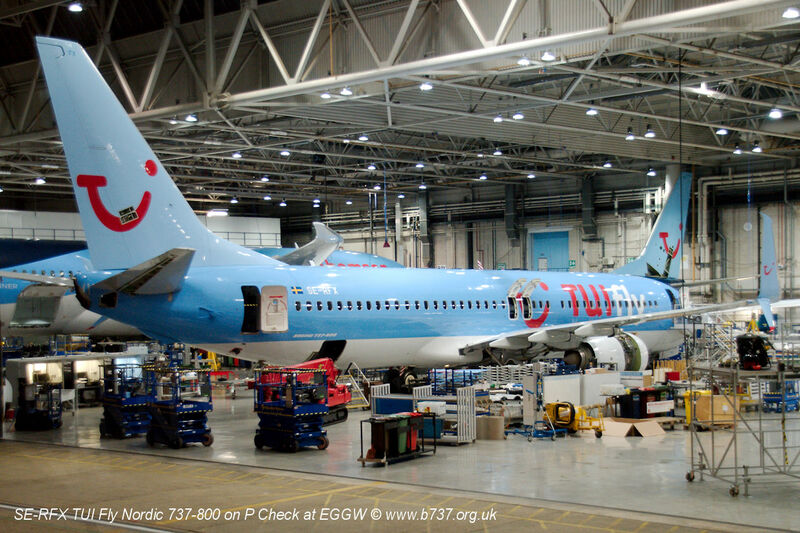 The first photograph below was taken whilst the aircraft was on a D check as part of the end-of-lease process. Most airlines lease rather than own their aircraft. Large airlines will often place a large order for aircraft with the manufacturer, then as soon as they are delivered, they will immediately sell them to a leasing company and lease them back on a fixed term, say for 7 or 9 years. This frees up capital for the airline. One of the conditions for the handback of the aircraft to the leasing company is that the aircraft is returned to the lessor in as good a condition as it was given. Whilst it is impractical to have a 7 year old aircraft in new condition, the accepted compromise is that a heavy maintenance program be completed before handback. With the typical high utilisation of a low cost carrier this equates to a P48 check which has a maintenance interval of 24,000 flight hours (FH). Such a check used to be known as a “D” check. One of the advantages of the 737 NG over the 737 Classic is that Boeing allow for intermediate base C checks before the D check to reduce the time, work and expense required at the D check. Operators that have a maintenance programme with a P48 check can have a base check interval of eight phases (hence the name P8), where one phase = 500FH, and so have six base checks in the base maintenance cycle. These will be P8, P16, P24, P32, P40 and P48 checks, often referred to as C1, C2, C3, C4, C5 and C6 checks. The P8 check will have an interval of 4,000FH and up to 18 months. The maintenance cycle will therefore have an interval of 24,000FH and up to nine years. A typical P48 check or (D check) can take 20-30,000 man-hours, 2 months to complete and cost several million dollars. Most operators will also use opportunity of the D check to incorporate other tasks such as incorporating EO’s, AD’s, SB’s, changing or refurbishing the interior and making any desired modifications to the aircraft eg installing Satcom for on-board Wi-Fi, TCAS 7.1, FANS B+, etc. 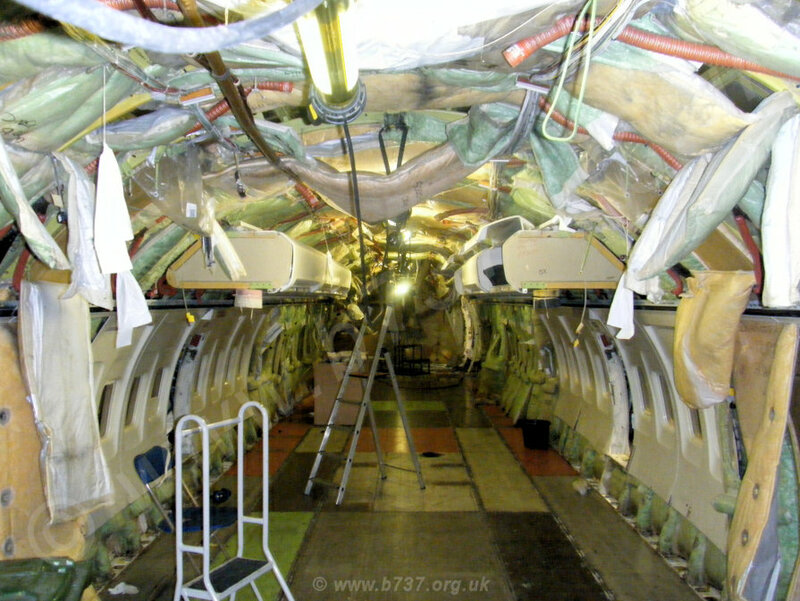 In the photo above you can see from the inside of door 1L that the interior has been removed, the seats are on the right of the photo. The airstairs have been removed and are on trestles near door 1L. The engines were removed but have been reinstalled and some of the cowlings can be seen in a stack. There is a cherry-picker up to the fin which may be working on the rudder. The leading edge devices have bene removed. The main undercarriage has been removed for servicing as well. In the photo above, the seats have been removed showing the many floor panels. The black circle in the middle of the cabin floor is the main gear downlock viewer. Most of the sidewall panels have been removed to expose the insulation blankets (see photo below). The panels are made from a crushed-core composite and are purely for aesthetics.